A Hawaii man suffered a heart attack as a result of the false missile alert sent out by the state’s Emergency Management Agency earlier this year, a lawsuit alleges. Honolulu couple James Sean Shields and Brenda Reichel received the alert and, according to the complaint they filed on Tuesday, “both plaintiffs believed this message to be true and were extremely frightened and thought they were going to die,” NBC News reported. Shields and Reichel went to the nearby Sandy Beach area of Oahu, reasoning that if they were going to die, they should be together on the beach. Around 8:15, the couple reached the beach and started calling their loved ones. After Shields got off the phone with his son and daughter, he began experiencing severe burning in his chest. 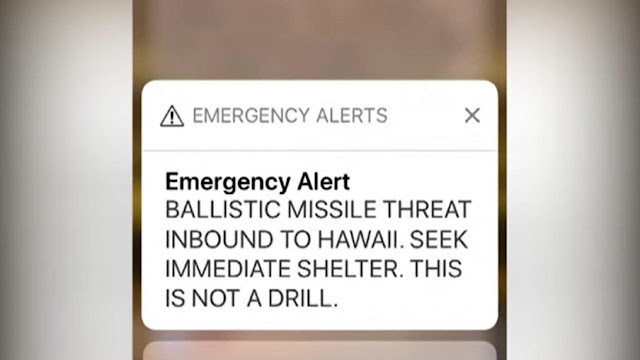 The official emergency message turned out to have been sent by mistake, but it took nearly 40 minutes for state officials to issue a follow-up alert confirming there was not, in fact, a missile threat to the islands. Shields and Reichel say they were unaware of the second alert being sent, because they went to Straub Medical Center for Shields to receive care for his symptoms. Once there, he went into cardiac arrest and had to receive CPR, defibrillation, and eventually surgery, according to the lawsuit. According to the Associated Press, the plaintiffs say the false alert and the state’s delay in sending the follow-up message was a substantial factor in causing Shields’ heart attack. Reichel joined the suit because she suffered “emotional upset” from witnessing Shields close to death several times during the ordeal. Defendants in the case include the state of Hawaii, the then-administrator of the Hawaii Emergency Management Agency Vern Miyagi, and several unnamed employees and entities. The lawsuit is seeking unspecified damages. On Monday, the U.S. Department of Homeland Security issued a report recommending changes to the nation’s emergency alert system after the Hawaii debacle. The inspector general suggests mandating that software used for alerts include both preview and cancelling features to prevent future errors.